Immaculate End unit located inside courtyard & offers a private deck & yard area. Gleaming hardwood floors throughout unit & full bath on 2nd floor. 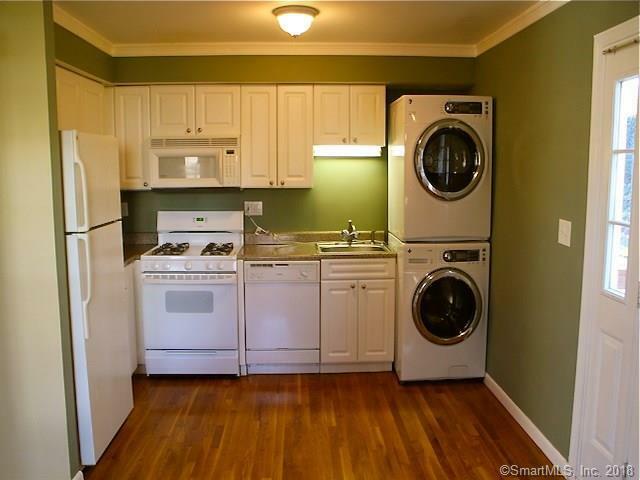 Kitchen has a nice open area w/ room enough for a table & contains a front load washer/dryer. Doorway in the kitchen leads to back deck area & semi-private yard. Upstairs you'll find 2 bedrooms, both containing closet organizer set-ups & smaller bedroom offers a wall mounted TV that stays. Heat, Hot Water, Trash removal & snow removal included in rent. Gas stove usage must be in tenants name w/gas co. Storage unit located in another building (close by). Complex conveniently located near I-95, Merritt Parkway & Fairfield Metro North. Renters insurance required by tenant. Small Dog considered.